We Support Agriculture (WSA) have scheduled their joint 2018 annual stakeholders meeting for Monday, November 19, at the Cornhusker Marriott Hotel in downtown Lincoln. 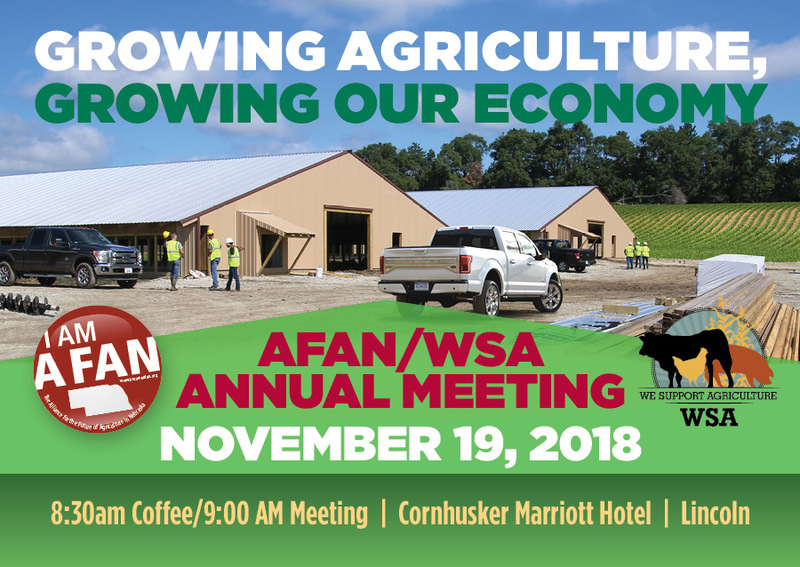 All AFAN and WSA partners and stakeholders are invited to the meeting, which begins at 8:30 a.m. with coffee and conversation, followed by the meeting at 9:00 a.m. A buffet luncheon, sponsored by the Nebraska Soybean Board, will follow the meeting. A highlight of the meeting will be a panel discussion focusing on the agricultural workforce shortage and housing issues. The panel will include Bill Thiele of TLS Dairy, Elizabeth Babcock with Adams Land and Cattle, and Gary Person from North Platte Area Chamber of Commerce. Craig Utter with the Sand County Foundation will present the 2018 Nebraska Leopold Conservation Award to the O’Rourke Family of Chadron, Nebraska. Those interested in attending the stakeholders meeting to learn more about AFAN or WSA and the future of animal agriculture in the state must RSVP to Judy Stauffer by November 12 by calling (402) 421-4472 or by emailing Judys@a-fan.org.